Borrell Associates put on a free webinar on Wednesday, hosting presenters Fred Jacobs (Jacobs Media) and Steve Goldstein (Amplifi Media) to talk about smart speakers, and their importance to radio (and other media types, secondarily). Jacobs and Goldstein teamed in April to create SonicAi, a tech support firm targeted to radio stations that creates smart speaker skills — the software which enables devices like Amazon Alexa voice-activated speakers to deliver enhanced station experiences to users via simple commands. 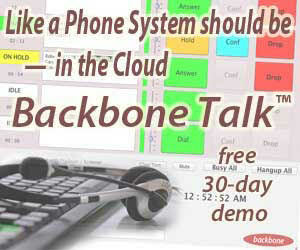 The webinar served to promote this new business, which competes in a quickly growing mini-industry of skill builders. But once past the company description the webinar was mostly thought leadership and actionable information for attendees. Fred Jacobs brought pertinent data from the latest TechSurvey, an annual survey of radio listeners that covers sentiment and usage of many distribution platforms. 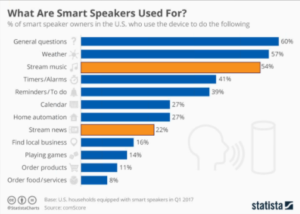 C”Smart speakers, in many ways, are the replacements of in-home radios,” he said, observing that in-home radios are fast on the wane. Hee noted that Amazon’s recent Prime Day sold three times as many Echo Dots (the least expensive Alexa product) as the year before. 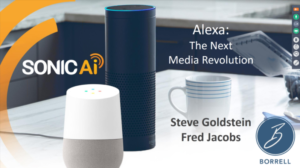 In this webinar, Jacobs and Goldstein focused mainly on Alexa devices, pushing Google Home to the side for the most part. “This is a rocket ship,” declaimed Steve Goldstein, describing three “science projects” occurring in his home — his three 20-something kids. In describing quick adoption of smart speakers in many environments, Goldstein noted that the Wynn hotels in Las Vegas have put an Amazon Echo in each room. Goldstein also gave a few examples of media brands moving assertively into the smart speaker space: NBC News, a morning show BuzzFeed, and the well-known Up Firs morning show by NPR and The Daily from the New York Times. Is it all a bubble? Thomas Edison said radio was a temporary fad, Goldstein reminded us. “We’re in the first inning,” he said. Play with it; get familiar. Focus on content that makes sense. How will your brand cut through? How will it sounds/ Alexa “reading is generally not a good experience. 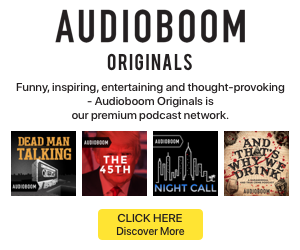 Authenticity = Your talent/writers/hosts are assets. Use them.